This past season I have entered into a whole new category of surfing…big wave surfing. Having lived on the North Shore of Oahu for a couple of years now, I’ve always had this desire to get out in the water on those super swells when every normal spot is closed out. And when everywhere on the North Shore is closed out, you are left with only a few options: Pipeline, Sunset, Waimea Bay, or some other outer reef. I know a lot of guys that charge big waves and they convinced me this was the year to do it. It is not as hard as it seems, but it does take some guts. 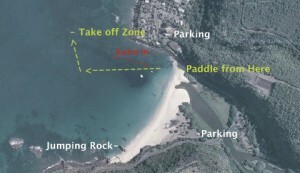 Here are a few pointers to surfing the legendary Waimea Bay. 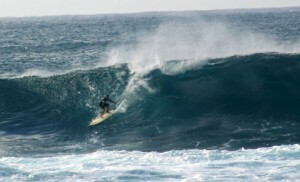 Try getting out to Waimea on an 8-12 foot day (Hawaiian Scale). On these days it is a lot easier to make it into waves and the consequences of falling aren’t nearly as severe. The crowd is a lot mellower, with just a few guys out usually. The currents aren’t as strong, and the shore break is not as treacherous. Also make sure you have a good-sized big wave gun, at least in the 9-foot range. Without the right board you will struggle to get into a wave. I started out with an 8’4 gun that was really meant to surf a place like Sunset or maxed out Pipe, and it didn’t go so well for me. All these things combined and you’ll have a perfect first-timer’s session at one of the most famous big wave spots in the world. Make sure you know what the conditions are like. Study the time between sets on the outside and shorebreak. Check out how strong the currents are and watch for a little bit to get an idea of what the ocean is doing out there. Paddle out on the side of the bay farthest from the jumping rock. In the beginning of the paddle, stay close to the rocks, right in front of the wave, and then the current will start to pull you to the middle of the bay, right out to the channel. Make sure you know how to swim in without your board. This is extremely important out there, because it is fairly likely you’ll have a situation where your leash or your board breaks and you have to get in without it. If you can’t handle yourself swimming out there, then don’t paddle out. To swim in, swim as close as you can to the rocks so you can avoid the current that pulls you out and to the other side of the bay. If you do this you also get some help from the massive walls of whitewater pushing you to shore. Waimea Bay is one of the few spots in the world where sharing waves is acceptable. On a big day out there it is a really cool experience. A lot of surf spots around the world are very quiet when they are crowded. People tend to not want to make a scene, and will carry on quiet conversations with a person or two but in general they aren’t very loud. Out at Waimea, everyone is stoked for everyone else. They cheer people into waves, share waves with friends, and look out for one another. Taking the time to prepare for surfing Waimea and getting out there on a big day should be something every surfer attempts to do in life. It will be the experience of a lifetime.